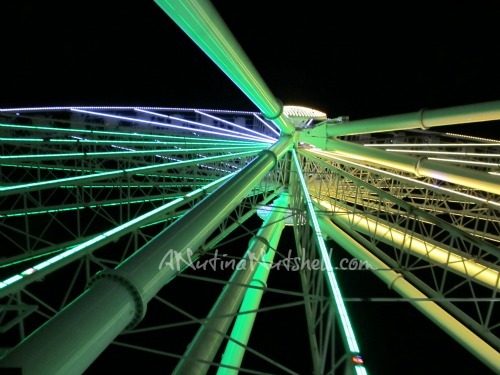 This is what the Myrtle Beach SkyWheel looks like by daylight. It’s a magnificent sight located in the heart of Myrtle Beach’s beautiful boardwalk and promenade area. Did I tell you that I hate Ferris wheels? So obviously I had to ride it. It stands 187 feet high, and if that’s not impressive enough, let’s go back to the fact that I hate Ferris wheels and decided to ride it anyway. 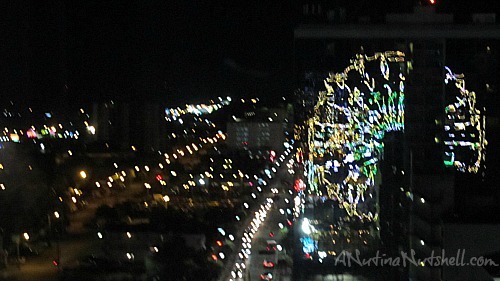 Fortunately, the view (even in the dark) made up for it. I loved how the lights from the SkyWheel were reflected on the neighboring skyscrapers. 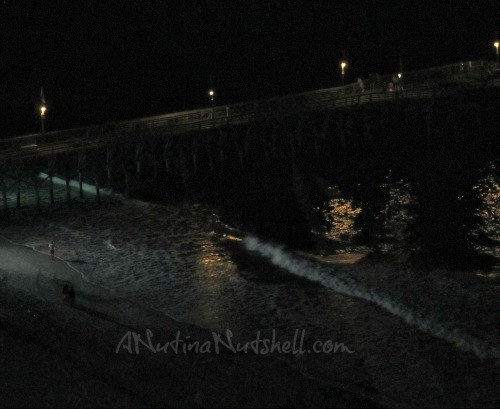 And even in the darkness, I could still see the waves washing up on the beach. The SkyWheel made three revolutions which allowed us a little more than ten minutes to enjoy the scenery. The gondolas are fully enclosed and don’t swing back and forth like regular Ferris wheels, so it was a completely enjoyable ride for me. It’s definitely a must-see Myrtle Beach attraction. 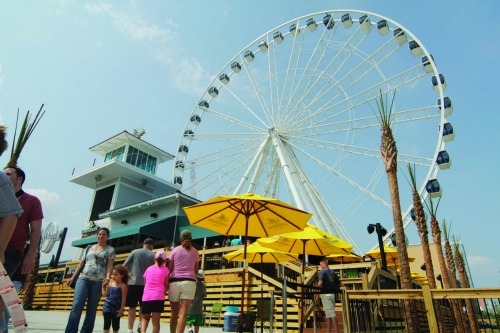 Visit the Myrtle Beach SkyWheel website for hours and to purchase tickets, and check out VisitMyrtleBeach.com for more ideas on things to do in Myrtle Beach. They recently built the world’s largest observation wheel here in Las Vegas and our entire family took a ride last summer to celebrate my mother in law’s birthday. Even those that are not a fan of heights had a great time! 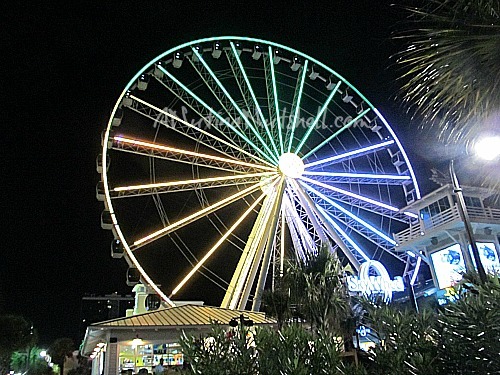 Myrtle Beach is on my list of places to visit – the skywheel looks amazing at night! My daughter and I rode this in August 2012, she loved it. You can see forever. A little pricey but you are on vacation so enjoy. I was TERRIFIED on the Skywheel but loved the views 🙂 I live in Myrtle Beach and every time we drive by it, my 2 year old says “Mama, Mimi, Thomas. Skywheel. Way way way up.” He loved it. That thing is huge and so pretty! I can’t even remember the last time I went on a ferris wheel. I need to visit Myrtle Beach. I’ve said it before and will say it again, you are far braver than I! Yikes all I can say is that looks scary I hate ferris wheels too high for me LOL. I can zip line but I hate Ferris Wheels. That really looks fun and beautiful. So cool that you did go on. Lovely but I would be so chicken to ride this! I love the photos. I don’t ride any kind of ride. My nerves are just too bad. I wish I enjoyed heights! I was scared just thinking about going up that high…you rock! It is gorgeous. I love this. So pretty!!! I can imagine how big it is in person. I have never been on a ferris wheel. I’m way too scared! My husband hates Ferris wheels also. But unlike you he won’t ride them anyway. I don’t think I can ever get on something like that but it sure does look like a ton of fun! I am way too much of a wuss to get on something like that! I’ve always wanted to visit Myrtle Beach. I love Ferris Wheels! Great photos. looks amazing. last summer i took my toddler on a non-enclosed ferris wheel and it was the longest probably 5 minutes of my life as he continued to ask – and by ask i mean scream – time to get off? time to get off. I love Skywheels. This one is beautiful. I used to love ferris wheels but now they make me anxious. I think it is an issue with hights that developed as I got older. It may be scarier at night, but wow is it beautiful with those lights! I rode a ferris wheel for the first time in 20 years at the beginning of summer. I scared the heck out of my kid!! I’m afraid of heights so this gives me the heebie-jeebies! that looks so much fun! i’ve always loved riding a ferris wheel. awesome shots! it looks like i could just step into the computer and be there! we live so close to hershery park the kids have passes..they go on every rollar coaster thrill ride in the park..except…the ferris wheel! I am so not into ferris wheels after going to a church carnival when I was a kid and the ferris wheel got stuck. I remember the screams of one girl that kept yelling, “Get me down from here. Somebody! Get me down from here! That’s awesome. I’ve always loved riding a Ferris Wheel. Wow, that is high. I don’t think I’d have done it, but I’m glad you enjoyed it. I love Ferris Wheels but none of my family members like them so it has been a long time. I mean I ride all the darn roller coasters with them, you think just once they could ride the Ferris Wheel. That is awesome!! I practically have to sedate Allison and Emily to get them on Ferris Wheels – lol, but actually they are fine right up until we have to step on – and they freak out – What? You couldn’t had told me this in the 30 minutes we were waiting? I wish we had the time to make it to Myrtle this year – we will get there next summer for sure – Are you ever heading the Raleigh way? We will have to HAVE to meet up! The views were definitely worth it! Awesome! Look at you trying all these new things lately! Good for you! I’m glad to hear you got to ride it and you got some neat pictures. Next time we are there I hope to ride it as well. I am glad you overcame your fears and rode it at night when it was even scarier. I think I’d like to do this too. So beautiful Liz but yeah, you would never catch me on that thing – night or not! I am a scardy pants when it comes to heights! I’ve always wanted to go to Myrtle beach. I had no idea it had this Ferris Wheel. Fun! Glad you braved it and even enjoyed it! Beautiful shots! That’s huge! I’m sure the view is more amazing from inside than out! Amazing pictures but you would never catch me in that! I am too scared of heights to even consider it! I about peed my pants on that thing! Myrtle Beach Rocks! I hate them myself. I went on the rickety old one in York, Maine with my kids and NEVER again. NEVER! Loved your pics. though! you do way more stuff that you are scared of lately. what’s with that? you are so brave, liz. My favorite pictures are Ferris Wheels and Sky Wheels like that. I’m not crazy about them but I will ride them. My brother use to make the ferris wheel swing and I hated that! That would be so cool to ride – I would love seeing everything all around while you are high up in the air. Great shots, Liz!!! I haven’t ridden one in many years and don’t know if I’d be brave enough in my old age. Not sure my heart could take 10 minutes of panic. It’s all I can do to survive hubby’s driving nowadays, without a heart attack. I like ferris wheels, even though they make my hands tingle. I’ve never ridden that one before. I’m terrified of Ferris wheels! I am fine as long as they move but if they stop at the top, I freak. Gorgeous photos! Myrtle Beach is one of my favorite places to visit! I do NOT like the regular ferris wheels that you can rock. They scare me so bad. The last time I rode one might be my last. This skywheel looks cool because you are a little more enclosed, but still looks scary! I’m terrified of Ferris Wheels! Many years ago a friend and I was on one, and he kept rocking it back and forth (I’m scared of heights anyway), and ever since, I just don’t like ’em. 🙂 I do appreciate the beauty of a Ferris wheel, though. Very pretty pics! I love seeing all of these pictures from bloggers going to Myrtle Beach. It has been hard for those of us who grew up around here (WNC) to get the picture out of our mind that Myrtle Beach is just a kinda gross spring break for college kids location. It looks like times are changing! WOW! How cool is that? I don’t remember seeing that when I was in Myrtle ~ although it was a few years ago! The SkyWheel in Myrtle Beach is amazing!! I wish I had seen it during the day time too! I forgot to mention that you took really pretty photos! I like that fact the seat do not move. Love the pictures!! Looks like a fun time for sure! It’s been a lifetime since I’ve been on any kind of ferris wheel. I love them though. Glad you managed to enjoy it in spite of your fear. Beautiful pictures!! I HATE Ferris Wheels, too – for me it’s a heights thing. One day, I’ll talk myself into doing this – just like you did – so I can say I DID IT! Cool pics!! It is a good thing they don’t rock!! So amazing! Myrtle Beach has sooo much to do! What a beautiful view! We almost stopped in Myrtle Beach on our way back from Savannah, but ended up driving straight through–now I wish we had gone! I loved ferris wheels until I was at the top when they let everyone off ha. Love the pictures! That must be a beautiful view, I could never ever do it! I love the area, would love to live there! My dad lives in North Carolina and they often go to Myrtle Beach. This makes me want to go now! Is it summer yet? Ooh! Gorgeous pictures! I can totally understand being terified, though. Heights…not so enjoyable! Very cool pictures! I can’t wait to go back to Myrtle Beach someday! So yeah, I hate Ferris wheels too. In fact, heights are not my friend. I got heart palpitations looking at those pictures. It is even worse when you have kids that demand you ride it with them, and then they stand up and look over the side while you ride! If you ever want to see me have a panic attack, just put me on a Ferris wheel with my kids. Those are some great shots, though. I would love to visit Myrtle Beach one day. Can I tell you Liz? I took Emma and her friend on one in a traveling carnival in August and I almost died. My husband is the same way! But I could NEVER get him on one! I got him one of the big ones that had glass all around each cart and I thought he was going to curl up in a ball and die. I am too scared to even move in a ferris wheel! I don’t have panic attacks, but the few times I have been in a ferris wheel it seems they want to stop the ride FOREVER while I am on top and I feel like I could have one! Of course every time that happened, the clown who talked me into riding it with them was bouncing around trying to scare me even more. Gasp… I am terrified of those, but I would have done it too! This is amazing! I have never been on a SkyWheel but it looks so beautiful at night. If I ever make it to Myrtle Beach this is definitely something on my to-do list! I hate ferris wheels too. They look so cool, but I am not a fan of heights at all. Knowing the fact that these gondolas are fully enclosed and don’t swing back and forth like regular Ferris wheels, I might actually try this one. I’ve been to Myrtle Beach and didn’t even know that was there! I like that it doesn’t sway back & forth… hate that! You made it! My lil Bo is terrified of them too & he is my toughest little guy 🙂 So I just hold him tight…the only thing he would like less is missing the ride while everyone else goes…so he is like you…gets on anyway 🙂 Good job girl! 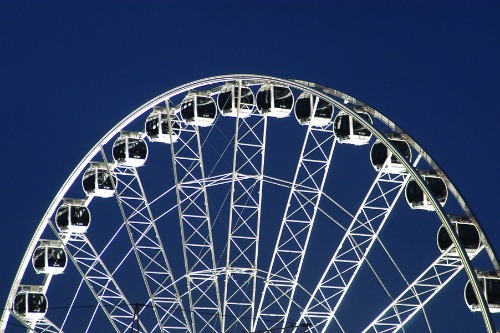 I’m not so afraid of Ferris wheels – only when they stop and I’m on the tippy top. At least the views were gorgeous. I hate most rides period. Mica has more guts than I do. We’ll see about Isaak. He’s too young to tell and is going through a funky stage. LOVE the Sky Wheel, and absolutely LOVE Myrtle Beach! We’re dreaming of having a vacation home there at some point. There’s so much for families to do, and we always have a great time. We rode the Sky Wheel our last visit…hubby wasn’t as keen, but he survived it! LOL! How fun! We haven’t been to Myrtle Beach in a while. We rented a house on Sunset Beach just north of there in NC. I loved that area – more low key. Sounds like a fun ride. I would like that they don’t swing. I hate the swinging. Did you just call it scary? They are so slow. I love them. I love all you can see from the very top! It has been years since I have been to Myrtle Beach. Years!! Love the reflection of it in the other buildings. Great pictures. I love ferris wheels, but I have much difficulty getting anyone to go on one with me. No one seems to think they are as great as I think they are. We road that last summer during the day. I would love to ride it at night! Same here, my daughter and I hate the ferris wheel rides, and so when we came across the magnificent one on the Navy Pier in Chicago, of course we had to ride it. My older son’s gf chickened out at the last second… said she didn’t want to ride it at night, lolol. And guess what, we got stuck. *sigh* And that made the toddler get antsy and want to look around. In a ferris wheel. At the top. We’re not riding again. 🙂 They sure do look fabulous when they’re this big though, don’t they? Happy WW. My Ex used to hate ferris wheels. One time he went up with me. I rocked the seated until the cheating SOB begged for mercy. That will teach him to run around. …. LOL… Thank God he is no longer in my life. Beautiful! !I would have been petrified to get on that though!